Dedicated 16” WideScreen Display Fishfinder with CHIRP! 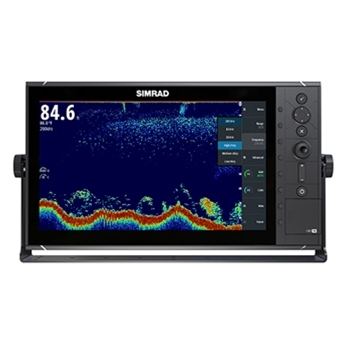 The Simrad S2016 has a Bright 16 inch widescreen display. A dedicated fishfinder with an integrated broadband module and chirp sonar, the s 2016 with Ethernet, NMEA0183 & NMEA2000 connectivity will connect with your compatible units seamlessly. The unit offers multiple networking capabilities while having the reliability of a self-contained fishfinder. The Large 16 inch S2016 supports a bracket mount or flush mounting capabilities and also offers HDMI connectivity when you connect a Simrad MO-series marine monitor or other compatible displays allowing you to connect to a monitor for a mirrored 2nd station. The S2016 includes an integrated Broadband Sounder module for plug-and-play transducers, compatible with Simrad and Airmar transducers equipped with blue 7-pin connectors adapters are also available to allow easy and cost-effective retrofit of existing Simrad, Airmar, and other third-party transducers. Offering a sleek yet durable design, the s2016 is tough enough to handle the rough conditions you may throw at it. With 8 direct access menu options the s2016 offers an intuitive operating system which makes operating the unit easier than ever. CHIRP sonar technology uses multiple frequency to deliver higher resolution, improved target separation, and greater image clarity than traditional sonar. 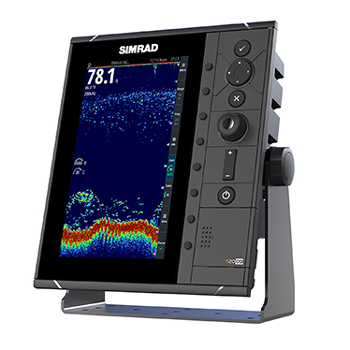 Simrad technology makes CHIRP available not just on special-purpose CHIRP transducers, but also via traditional single-frequency transducers. Vessels with a suitable transducer already installed can add CHIRP simply by installing an S2000-series Fish Finder, offering an extremely cost-effective upgrade. Designed with cutting edge technology, the 2016 allows you to recognize the bottom with a clearly marked white line which separates the water column from the bottom. The white marker allows any user selected color from the fish finder image to be replaced with a high contrast white allowing you to highlight specific sonar echoes corresponding to fish or other targets of interest. The color erase feature allows any selected color to be blended into the background, eliminating unwanted noise or unimportant features from the display. From a Charter captain to a sport fisherman the S2016 will not let you down. Broadband frequencies: 28 KHz, 38 KHz, 50 Khz, 83 KHz, and 200 KHz.